WinX Free MPEG to MP4 Converter is a free video conversion program which is committed to converting MPEG to MP4 formats for playing in MP4 compatible Mobile devices, such as Nokia, Motorola, etc. Moreover, it enables user to take snapshot from stream MPEG video to save as PNG. 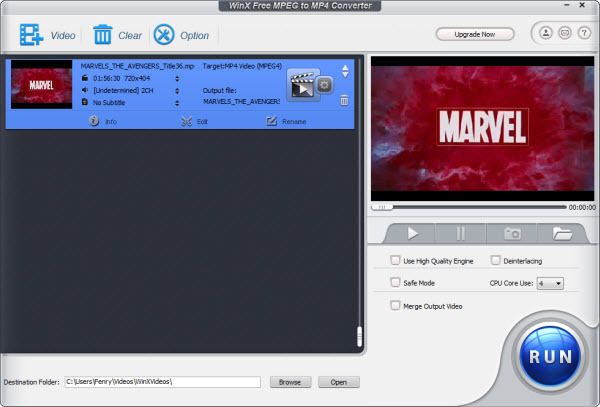 Armed with user-friendly interface, this MPEG to MP4 converter freeware makes MPEG to MP4 conversion routine as simple as a one-click solution. Hyper-threading technology supported and High Quality Engine inside, it gives an excellent video and audio effect in fast speed. What's more, it supports batch conversion that allows user to convert more than two video at a time. WinX Free MPEG to MP4 Converter can help user free convert MPEG video to MP4 with high quality and fast speed. Support taking snapshot as PNG to be used as wallpaper. Own to its High Quality Engine, this free MPEG to MP4 converter offers quite good audio and video quality. Hyper-threading technology supported, this free MPEG to MP4 converter offers 300%-500% real time converting speed. Batch and single conversion supported to allow user convert more than two videos and video segments. Users could fully control the audio and video parameters according to their needs.